EMC is offering a guarantee with its Celerra unified storage arrays, saying you will need 20 per cent less raw capacity than from other suppliers, even though previously its bloggers have said such gimmicks are abhorrent. You've got to use EMC best practices and there's no direct performance guarantee. Instead EMC states: "This translates to superior storage efficiency when compared to other unified storage arrays — even those utilizing their own documented best practices." EMC says that if its storage products are not more efficient by 20 per cent it will match the shortfall. The 20 per cent guarantee is for EMC unified storage (file and block—at least 20 per cent of each) It’s based on out-of-the-box best practices. There’s no need to compromise availability to achieve efficiency. There are no caveats on types of data you must use. There’s no need to auto-delete snapshots to get results. This guarantee is based on standard out-of-the-box configurations. 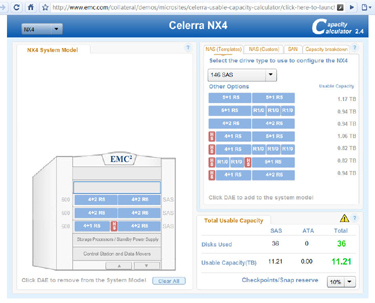 You can use EMC's online capacity calculator which works with the NX4, NS-120, NS-480 and NS-960. For us it didn't work with Internet Explorer, the displayed picture was tiny. It was okay with Chrome, although the image colours make it look washed-out. You don't start by putting in the usable capacity you want. Instead you choose disk capacity and type options, 600GB SAS for example, and then select from various RAID schemes. We put in for three shelves of 600TB SAS drives with RAID schemes on an NX4 and got 11.21TB usable capacity out of the 21.6TB of raw capacity. Now you have to compare that with NetApp or HP or whoever to see if you need at least 20 per cent more raw capacity to achieve the same end. It's a pity you can't do a direct comparison on screen against the other suppliers, but asking for the moon isn't realistic. EMC bloggers have panned storage guarantees from other suppliers like 3PAR, NetApp and Pillar Data. For example, Chuck Hollis, an EMC VP and marketing chief technology officer, criticised NetApp's original 50 per cent less space guarantee saying: "Personally, I detest marketing initiatives that prey on people's lack of familiarity with certain topics. So, what's my beef? Go look at the fine print." He listed some of the fine print requirements and blogged: "I feel like I'm watching one of those local TV ads watching Crazy Eddy peddling used cars on Sunday morning. "Despite the fact that EMC abhors this sort of gimmick, I offered that for many years EMC has offered a storage optimization service where we come in and look at process and procedure with the goal of reclaiming underutilized storage. Sometimes we do this on the basis that we'll find more storage savings than the service costs, so you don't pay unless we find the pony." So now EMC is offering its own guarantee, with Chuck tweeting: "I'm actually OK with the EMC offer -- it's simple, easy and not sleazy. :-)"